The Google and LG Nexus 4 goes on sale tomorrow, 13 Nov in some lucky countries. Too bad Singapore is not one of them. However, if you wish to purchase it, you could try to get your orders in tomorrow and ship them to forwarding services such as ComGateway, Borderlinx or VPostUSA. 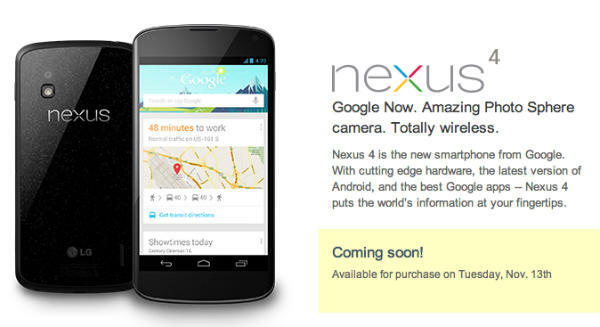 First and foremost, the Nexus 4 would only be available tomorrow from Google Play! Store. There’s an IP or location verification check that you would need to bypass here to get to your order. Hence, you would need a proxy or a VPN to bypass this first check. You could check out VPN and similar methods highlighted here for similar access for the Nexus 7. Next up is for the payment method. If you have access to a US Credit Card, great! Otherwise, international credit cards may get rejected but you may wish to try out this method. Assuming you’re already registered on Play Store and Google Wallet, log on at wallet.google.com and click on “Payment methods”. Fill all fields with your card info, except “Address”. On “Address”, you will need to set an US valid address. Do note this method is rather unreliable. Other user experiences back during Nexus 7 times highlighted that some orders were withheld by Google due to the address mismatch. Do consider a concierge service (highlighted below). Next step, find a forwarding service. For ComGateway and VpostUSA, their shipping address is at Portland Oregon. The state does not charge additional taxes so that’s great. On the other hand, Borderlinx is in Ohio and will be taxed. If the credit card step above didn’t work out for you, you could try out a Concierge shopper servvice like ComGateway but it charges a 5% buying fee. It it is going to be a crazy day on November 13, with no pre-orders for the Nexus 4, and it being shipped out on a first come, first serve basis. Google has not reveal the exact time when orders will start, or when the orders will actually ship once you have successfully placed an order. So quite a lot of people would be refreshing their screens in anticipation. Overnight shipping would be an option for those who want their Nexus 4 fast. And Google has indicated that devices with this option selected could receive it as quick as on November 14. This would also apply for the Nexus 10. There has been alot of interest in the Nexus 4 during the build up in the last couple of weeks, and we are anticipating the initial stock to run out quickly. For people who plan to import the Nexus 4 into Singapore, take heart! LG Singapore has acknowledged over Facebook in recognising the purchase and supporting the device in terms of warranty claims too. That’s good service. LGSingapore confirmed it on their facebook page. But their customer service reps at LG Care denied it. They told me that it is not true. Google Maps Navigation – Singapore goes live!